The group has already secured a major spot in the Coachella 2019 lineup. Jeff Benjamin is a K-pop columnist and contributor at Billboard. Get ready for BLACKPINK in your area. If you don't get that reference from BLACKIPNK's debut single "Boombayah," you soon will. The K-pop girl group is making their U.S. morning-show debut next week on "Good Morning America" as they kick off what is looking to be a huge year for the pop act. (VCG via Getty Images) Members of South Korean girl group BlackPink attend the SBS Singing Competition, Dec. 25, 2018, in Seoul. 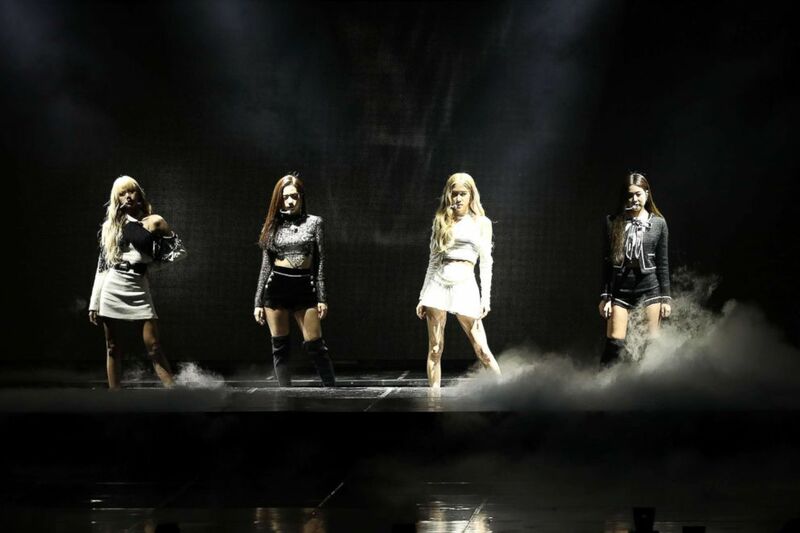 BLACKPINK has already announced they'll be doing a U.S. tour, have secured a major spot in the Coachella 2019 lineup, and recently revealed a new record deal with Interscope Records, a label that's home to Lady Gaga, Zedd, Selena Gomez and more. So, if you've been looking for a new group for fall for, BLACKPINK is primed to be your new obsession. Ahead of their "GMA" debut, get to know the girls with a primer including all the must-know facts. While the group is based in South Korea, each member hails from a different background and parts of the world. Think of them a bit like a new Black Eyed Peas, with different members representing different sections of the world. Loads of people who can identify with and see themselves in the girls. Vocalist Jisoo, 24, was born and grew up in South Korea's capital, Seoul. Meanwhile rapper-singer Jennie, 23, lived in Auckland, New Zealand, before moving to Seoul, and powerhouse vocalist Rose, 21, was also raised in Australia before coming to Seoul in her teen years. Lisa, a rapper who is also 21, was born in Bangkok, Thailand. (Chung Sung-Jun/Getty Images) Girl group BlackPink performs on stage during the 8th Gaon Chart K-Pop Awards, Jan. 23, 2019, in Seoul. When BLACKPINK was introduced to the world, the group's name was said to be a twist on what we usually think of for the color pink. Typically considered feminine color, the addition of black brings a sense of mystery and edge. That's represented by the members' artistic tendencies too, with vocalists Jisoo and Rose paired with rappers Jennie and Lisa. BLACKPINK started 2019 with a major YouTube accomplishment. The group's "Ddu-Du Ddu-Du" music video reached 600 million views by Jan. 13, about half a year after its premiere, making them first K-pop group to hit such a milestone so quickly. The only other Korean acts to have a music video surpass 600 million views are BTS and viral phenomenon Psy. Meanwhile, BLACKPINK has more than 18 million subscribers on YouTube and has racked up huge numbers for the rest of their videos too, like "As If It's Your Last" (more than 500 million views), "Boombayah" (488 million), "Playing With Fire" (335 million) and "Whistle" (316 million). If you thought their YouTube numbers were impressive, just check them out on Instagram. BLACKPINK's group Instagram account currently boasts more than 15 million followers, while each lady has more than 10 million followers on their individual accounts. With a current follower count of over 14.5 million, Lisa is currently the most-followed female celebrity based in Korea ever on Instagram. Smash that follow button for all five accounts if you haven't already. Each member of BLACKPINK trained between four and six years with their Korean record label, YG Entertainment, before officially hitting the K-pop scene. While that might have seemed like an eternity to wait, that hard work seems to have only brought Jennie, Jisoo, Rose and Lisa closer. Jennie may have put it best in an Instagram post on the final day of 2018: "We laugh, we smile, we hug, we love, we care, we work, we cheer, we cry, we live, we dream, we eat, we travel, we dance, we sing, we are BLACKPINK. I LOVE YOU." She included a photo of the group in a close hug. Girl power, indeed. We laugh we smile we hug we love we care we work we cheer we cry we live we dream we eat we travel we dance we sing we are blackpink ILOVEYOU????? ?